Red Riding Hood is the first in NetEnt’s new Fairytale Legends series, taking the classic story of Little Red Riding Hood to the reels of the pokies in an enchanting game packed to the brim with bonus features and winning potential. Read on to find out how to play this action packed pokies game and the best online casinos to play Red Riding Hood for real money. Everyone knows the story of Little Red Riding Hood, the young girl who sets out for a journey through the forest to visit her sick grandmother before meeting a big bad wolf who makes it his mission to eat the girl. 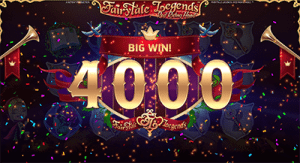 In this five-reel pokies game, NetEnt has adapted the famous fairytale wonderfully, with the reels set amidst a charming forest with Little Red Riding Hood herself strolling happily alongside the reels. In the base game it’s all fairy dust and magic, with no appearance by the big bad wolf unless you proceed to the mini bonus game, which makes for an enchanting gaming experience, complete with whimsical soundtrack. In true NetEnt style, Red Riding Hood is packed with bonus features, including wilds, symbols, free spins, a separate bonus game and several random bonuses. Like all of NetEnt’s casino software, Red Riding Hood is available for instant-play directly over your Web browser. Simply head to one of our recommended casinos in the table above to play Red Riding Hood without having to download a thing, and sign up to claim your exclusive new player welcome bonus. Red Riding Hood can be sampled for free in practice mode, or for real money bets by making an instant deposit using a trusted payment method. To play for real money, simply select the size of your wager using the buttons at the bottom of the reels. Red Riding Hood has 20 fixed paylines, so all you need to do is select your bet level between one and 10, and the coin value between 0.01 and 1.00. The minimum bet starts at $0.20 while the maximum bet is capped at a high $200.00. An auto-play feature also allows you to pre-set up to 1,000 spins with the click of a button. 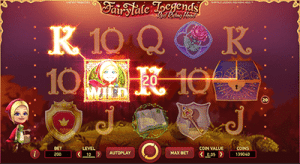 Wild Symbol – The games wild is the smiling Little Red Riding Hood, which appears on reels two, three and four during the main game and all reels during free spins. If two or more wild symbols appear during the main game they become sticky wilds and are held in place for the duration of one free re-spin. Bonus Games – Three of the blue treasure chest bonus symbols appearing on reels one, three and five during the main game will trigger the bonus feature, where you’ll be presented with one of three chests to open and reveal the bonus game lying within. You can either trigger 10 free spins, a coin win which is the current bet multiplied by 15, or the Beware the Wolf bonus game. In the Beware the Wolf bonus game, you’ll be taken to a board game style screen where you get to spin a device which determines how many moves you make across the screen, collecting coins along the way. The bonus game comes with five different directions: double, arrow, coin win, jackpot coin win and collect. Random Bonuses – There are three different random bonuses which can be triggered at any time during the main game. In the Fairy Magic Spin, a random cluster of five to nine medium win symbols appears as an overlay on the reels for the duration of one spin. The Fairy Surprise randomly selects a medium win symbol after a non-winning spin and the fairy comes out to splash her magic wand around and turn other symbols into the matching selected symbol until a win is awarded. 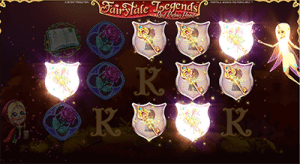 In the Fairy Wild Spin bonus, three or four wild symbols randomly appear on reels two, three and four during the spin, and after the reels stop a Sticky Wild Re-Spin is awarded. If Red Riding Hood is anything to go by, NetEnt are really onto a winner here with their new Fairytale Legends series and we can see this collection of games being as popular as the NetEnt Rocks trilogy. Red Riding Hood is proof of NetEnt’s commitment to producing high quality, creative pokies going above and beyond player expectations, offering an impeccably designed game with an abundance of bonus features. During our testing, the bonus feature plus the random bonuses were pretty difficult to trigger, but when they did they really paid off, so this game will certainly keep you on your toes.